Tough on the outside. Smart on the inside. Ollie’s polycarbonate shell protects its engine while the robot’s design repels water. Drive it down the stairs, through the dirt, or straight into a wall. Ollie also has the brains to match its brawn. Onboard intelligence tracks distance, airtime, colour preferences, trick combos, and more. It’s time to upgrade your play. Simple App. Extreme Fun. Drive by dragging your or turn your device sideways to turn on trick mode. Heroic. Tenacious. Limitless. Courageous. Get in the drivers seat with the leader of the robot racing revolution. This is Ollie a total adrenaline junkie that draws its energy from unbridled speed and extreme stunts. Command this app-enabled robot to execute tricks and dominate every inch of turf, trail, and track. There’s a rebel lying deep in Ollie’s soul. Ollie rolls at speeds of up to 14 mph and connects instantly to your device via Bluetooth LE with a range of up to 100 feet. Turn on a dime with the included Nubby Tires or take them off to drift like a street racer. Powered by USB charging, Ollie glows in millions of colors and is ready to roll out. 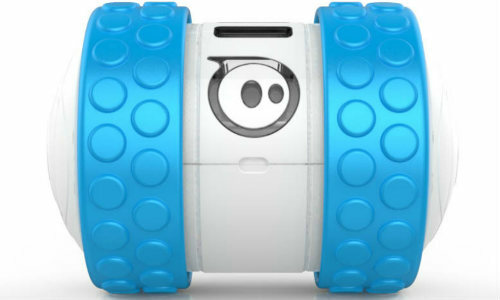 Sphero Ollie Robotic Ball is rated 4.0 out of 5 by 2. Rated 4 out of 5 by anniemc from Ollie the way! This was a great gift buy for our 9 year old son. It is a fun robot, in that it can be used on a variety of terrain - inside and outside. It is challenging in terms of the movement/maneuvering being difficult enough to master - this is great as there was a challenge and fun at the same time. Downsides are; (1) that the battery power is not very lengthy, and (2) the robot is steered using a device (phone/tablet), which means the child must have access to a device to be able to use Ollie. Rated 4 out of 5 by PAUL007 from Great robotic product I bought Ollie a couple of weeks ago as a birthday present for an eight year old and i must say it has proved to be worth every euro I spent. Ollie now goes everywhere with my nephew and he i now looking to program and automate some of the functions. This is a great product and will provide endless fun in many different situations.